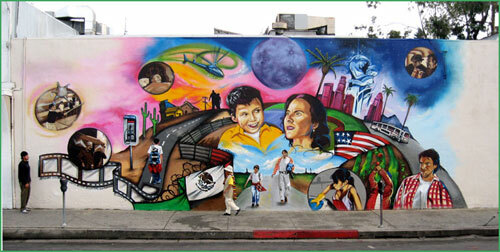 Murals have long been an important part of visual landscape of Los Angeles, particularly in their illustration of the city’s cultural and political history. Unfortunately, murals on private property have been caught up in the recent legal battles between the city and the outdoor advertising industry, which has argued that the city cannot enforce its sign ordinance, including the 2002 ban on new billboards and other forms of “off-site” commercial advertising, if it doesn’t apply the same enforcement to public art murals. As a result, the city has been forced to cite owners of properties with murals for violation of the ban. But now the city Planning Department has proposed a way to allow these murals, and a joint committee will be discussing the proposal this coming Wednesday, Nov. 19. This proposal essentially allows private property owners to donate an “art easement” to the city for a wall with an existing or proposed mural, thus turning that piece of the property into a public space exempt from the city sign ordinance. Anyone interested in this issue should plan to attend the hearing and/or send comments to the committee members. See the committee agenda and planning department report here.